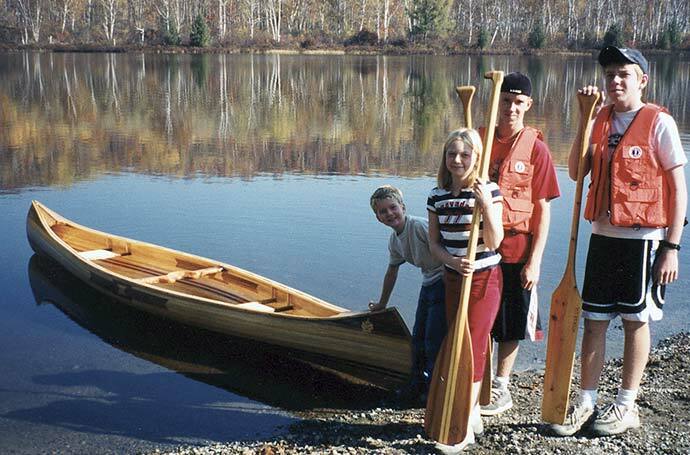 Russell, Jamie, Tyler, and Justin Wilson are seen here standing beside their family's canoe, CANADIAN PRIDE, at its launching in October 2003. The four children were a big help to their father, Bryan, during the 300 hours of construction of the 17'6" Red Bird canoe, which is shown in the book Canoecraft by Ted Moores. The stripped hull is made from white cedar with red cedar accents. The yoke is hand-carved walnut. Bryan used white ash on the decks and gunwales, and laminated maple and oak for the stems. He inlayed a 4' Maple leaf into the bow and stern of the boat. He plans to use the boat in the waters around Sudbury, Ontario, Canada. Find Bryan and his kids at b-wilson7@hotmail.com.